At the beginning of QCC introduction, Layana has upheld sound and fulfilling ideas to establish seed circles for laying a foundation. The implementation has been progressively from easy to difficult to slowly reach full participation, full quality, and full improvement goals. Then the QCC effect has been more outstanding. 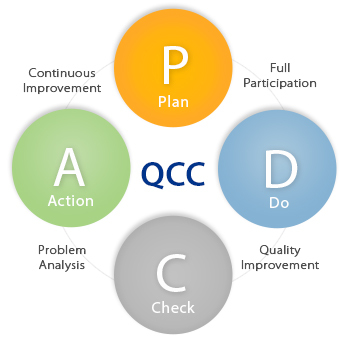 QCC activities, we have been constantly identify problems, analyze problems, and improve issues to find a good countermeasure for the best way enacted into standardization and the developed habit of everyone to comply with standard operation in order to systematically manage the scene and have a “quality-centric” concept of everyone for the work site to become the focus of quality control. 1) Improving site problem to make the scene improved in a timely manner; reducing waste and costs to enhance the competitiveness of enterprises. 2) Enhancing the team level, strengthening themselves, and building a strong on-site team through full participation, self-development, and mutual inspiration. Layana especially set up incentives to motivate each employee in 2013 for them to implement QCC activities, have the concept of quality in their work, and full of self-improvement commitment to quality assurance rather than simply relying on manufacturing chain for product quality requirements. ※ Valid until December 31, 2013. 2014 reward system will be announced separately. 1) One-time bonus including NT$ 500, NT$ 1,000, NT$ 1,500, or NT$ 2,000. 2) Reward system of foreign employees is also included in QCC activities: bonus including NT$ 100, NT$ 200, NT$ 300, NT$ 500, NT$ 700, or NT$ 1,000. 4) No limit of proposal number, receiving bonuses as long as approvals, bonus amount determined by the QCC chairman and general manager, bonus distributed on Monday morning session. Instructions: 1) In accordance with ten steps of PDCA. 3) Audit team including General Manager, Senior Executives, and Department Heads. ※ Department Heads can not participate in the vote. Supervisor does not participate in the proposal, but the heads of the department are required to assist colleagues’ proposal. If the proposal is approved by voting and is well implemented, bonus amount for supervisor will depend on the proposal bonus and department employee number and will be up to NT$ 1,000 / month.